This month we began the dreaded “daylight saving time.” Dreaded because we lose an hour of sleep the Sunday morning that it begins, and the after-effects go on, at least in my case an entire week. That Sunday morning is a time when those of us in the ministry have to function with less sleep, which we did on the First Sunday in Lent. It really gives new meaning to Lenten discipline when lay people make their Lenten vows to be at Mass at least every Sunday and then the temptation to roll over and sleep that hour comes so soon! This leads into the subject of the disciplines that you have prayerfully committed to live under as your Rule. We are reminded that the positive disciplines which you hopefully have taken, are certainly something that can be carried on as you progress through the remainder of the year and beyond. Making the commitment to attend Bible Study, or Stations of the Cross, doing the Morning and Evening Offices from the Prayer Book; these positive disciplines. Assisting with the local feeding of the homeless or giving alms for the Lenten Appeal are all ways we can assist others and should be something we take on regularly, Lent or not. Concerning our Lenten Appeal for 2019, (to build our second Elementary School as a joint effort with Operation Mobilization/Good Shepherd Schools), Bishop Haines informed me that the search for land has been successful. The property is close to Jamalamadagu where Presiding Bishop Jaya Rao has his Cathedral. We raised just over half of the needed $150,000 with our 2018 Appeal and we need to do likewise for 2019. Bishop Haines also reminds us that this School building serves a larger ministry in providing space for adult education programs such as teaching computer and sewing skills. The School becomes a Center for activities for the village where it will be located, but most importantly provides the children with an education to help them escape poverty and hopelessness. Please help these needy people and be generous. As of this writing, Bishop Haines reports that the land for the school has been selected and the funds from the 2018 Lenten Appeal will be sent to secure the purchase. This means that the remaining funds from the 2019 Lenten Appeal will be used to build the school building. We are half-way through Lent, so let us all be committed to complete our goal. Among the regular business and special sessions at this year’s DEUS Synod, I have called for the election of a Bishop Coadjutor. 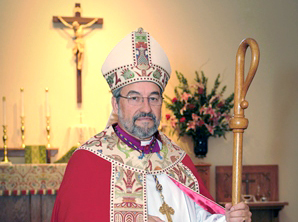 This Bishop is to be elected by the Diocese. To reiterate from my last Epistle, I am not being pressured to retire and I am in good health. Our Diocese is strong, unified and on the move forward, and we have a duty to make this important decision while we are in a state of peace and general good will. I do not plan to retire upon the election of a coadjutor, but will be a mentor and provide for the smoothest possible transition. If you plan to make a nomination, please be careful to follow all the instructions listed below. Nominations for the election of the Bishop Coadjutor of the Diocese of the Eastern United States may be made by any clergy member in good standing or by any adult lay communicant in good standing in the DEUS. Nominations are now being accepted. The nomination must be made by letter mailed by US Mail to the Secretary of the Standing Committee of the DEUS, Dss. Deborah Kidd at 3856 Pennington Rd, Greer, SC, 29651 and must be received on or before May 19, 2019 (60 days prior to the election to be held on July 18, 2019). This is a firm deadline! The nomination must include a letter from the candidate that the candidate is accepting the nomination and must be signed by the candidate. The nomination should also include a detailed description of the qualifications for the candidate that is being nominated, including but not limited to a Curriculum Vitae. If the nomination is not complete and received by the deadline given, the nomination will not be accepted. Nominations will not be accepted by any other means, including email, fax, text, photo, etc. As I also previously mentioned in my last Epistle, we need to prayerfully consider one who has the temperament, the education, the personal holiness, humility and genuine love for others as we make our choice. Some skills can be learned over time, but character and preparation are prerequisite. I ask that this be a time of prayer for all of us as we ask that the Holy Spirit guide us in choosing the right man to fill this critical role. In mid-February 2019, the APA sponsored a Pilgrimage to the Holy Land. It was great to be a part of this trip personally, along with my wife Mary and a total of 20 of our own people. It was very special to me, as I visited there some 43 years ago at the ripe age of 33. The Holy Sites obviously do not change, but the new archeological findings do create a sense that there is always more to discover in this ancient land. Our tour guide, Yair Mazur of AMI Tours, was excellent and knows the land as well as the Scriptures, both Old and New Testaments. Our Pilgrimage spiritual guides were Bishop Chad Jones and Father John Klein, both experienced in drawing on the historical and making it relational to our Christian lives today. We were privileged to celebrate Mass at many of the Holy Sites in ancient parishes built by our Christian ancestors. Many of these places are maintained by the Franciscan Order of the Roman Catholic Church and they were kind enough to allow us to celebrate, read and sing in the Holy Places. To me one of the most moving experiences was doing the Stations of the Cross in the streets where Jesus walked on his way to Calvary. We took turns carrying the Cross, as the streets we traversed were filled with busy commerce along the way. We stopped at each designation of the Stations and were able to speak over the noise of the crowds and sing the Stabat Mater. Although a physically demanding trip with quite a bit of walking, everyone did well. We had three 80-year-olds and two others who used a walker on occasion and still we managed to see all of the Sites we had set out to visit. In addition to Bp. Chad and Fr. Klein, we were privileged to have other APA clergy on the trip including, Fathers James Johnson, Paul Rivard, and Deacon Louis Linn. On the Sunday when we were in Jerusalem, we concelebrated the Mass in the Chapel in Bethphage on the Mount of Olives, from where Jesus made His triumphal entry on Palm Sunday. The Franciscans provided a complete set of red chasubles for each of us to use. That was very kind of them. Father Larry passed from this life to the life Expectant on Friday, March 29, 2019. Father Larry was bi-vocational for many years serving as Vicar of All Soul’s Anglican Church, Asheboro, North Carolina, and also as a law enforcement officer with the Randolph County Sheriff’s Department. He was retired from both. We remember him primarily as the driving force in building All Soul’s Church from temporary quarters to the lovely facility built by the membership on Old Cox Road, Asheboro, North Carolina. Canon Emerson retired from his role as Vicar and later was appointed Vicar Emeritus. He and his wife Lindsay remained as active members of the Mission. God Rest His Soul. Father Harlow was invited to do a presentation at the Mercer University in Macon, Georgia at the opening of the Bramlett Collection of C. S. Lewis material at the Tarver Library. In his presentation entitled C. S. Lewis in the Family and the Church, he discussed the relevance of C. S. Lewis’ Anglicanism and his universal appeal to Christians. Fr. Matt was a member of a panel that discussed C. S. Lewis and his writings. Father Harlow is the Rector of Christ the Redeemer Anglican Church in Warner Robins, Georgia. Wishing everyone a blessed Lent and Holy Week and the Joys of the Resurrection. Below is the text from a thank you letter from Fr. Steve and Aracelly Sommerrock for the APA’s support after a fire destroyed the house into which they had just recently moved. Greetings in the Name of our Lord and Savior Jesus Christ. The devastating fire that took 98% of everything we owned, except our two cars, has truly turned our lives upside down. We can only thank the Lord for saving our lives that early morning. We have also been truly blessed by the generosity that you all have provided us, both financially, in your prayers, and caring words. We are humbled by this and as we look forward to rebuild our lives, you will always be in our thankful prayers. We will be moving to Summerville, SC sometime mid-May when the house we are purchasing should be ready and will keep the office updated. The Diocese of the Eastern United States, APA, will hold their Diocesan Synod in Orlando/Oviedo, Florida, the week of July 15, 2019. Please see the flyer on the last page of this Epistle for more details. Online registration is open. Deadline for Synod Registration and Hotel Reservations (at group rate) is June 14, 2019. As mentioned previously, this Synod will include the election of a Diocesan Bishop Coadjutor. A Summons has gone out to all DEUS clergy separately. Reminder: all DEUS clergy are required to attend unless excused by Bishop Grundorf. DEUS: The Rev. Mr. Erik Wilson was ordained to the Diaconate on March 2, 2019, at All Saints Parish, Wilmington, NC, by the Rt. Rev. Chandler Jones. Deacon Wilson will serve at All Saints as a Deacon. DEUS: Mr. Dennis Ryan will be ordained to the Diaconate on April 6, 2019, at St. Paul’s Church, Crownsville, MD, by the Most Rev. Walter H. Grundorf, D.D. Deacon Ryan will serve at St. Paul’s Church. DEUS: The Rev. Fr. Brian Oldfield will be installed as Rector of St. Paul’s Church, Melbourne, FL, by the Most Rev. Walter H. Grundorf, D.D., on June 2, 2019. DEUS: The Rev. Dennis Washburn has transferred to the ACNA, Diocese of the Carolinas. DEUS: The Rev. Mr. J. Boyd Baker, St. Alban’s Cathedral, retired March 1, 2019. He will remain at St. Alban’s as a Deacon-in-residence. DEUS: The Rev. Kevin Burks, St. Luke’s Church, Port Orange, FL, will be retiring August 1, 2019. DJ Fulton; Canon Emerson’s wife Lindsay; Fr. Steve and Aracelly Sommerrock; Fr. John Gibson; Bishop Rushlow; Bishop Hanlan; Bishop Shaver; Fr. Conway; Fr. Carter; Fr. Bakley and wife, Pat; and Fr. Gardner. Prayers answered: After being given a terminal cancer diagnosis, Fr. Conway’s doctors now report his scans continue to look miraculous – no evidence of disease. Praise be to God! Thank you for your continued prayers for his remission. RIP: Canon R. Larry Emerson; Pat Fulton (wife of APA and DEUS Treasurer, DJ Fulton). Apr 6: Ordination of Dennis Ryan to the Diaconate, St. Paul’s Church, Crownsville, MD. Apr 7: Episcopal Visitation, St. Paul’s Church, Crownsville, MD. Apr 8-9: Funeral for Canon R. Larry Emerson, Asheville, NC. Apr 14-21: Holy week at St. Alban’s Cathedral, Oviedo, FL. Apr 27-28: Visitation to potential Mission. May 5: Holy Land Presentation, St. Alban’s Cathedral, Oviedo, FL. May 11: Episcopal Visitation, St. Matthew’s Church, Weaverville, NC. May 21: Meeting of the Federation of Anglican Churches in the Americas (FACA), St. Barnabas Church, Dunwoody, GA.
May 25-26: Episcopal visit, St. Patrick’s, Brevard, NC. Jun 2: Institution of Rev. Brian Oldfield as Rector of St. Paul’s Church, Melbourne, FL. Jun 8-9: Episcopal Visit, St. James Church, Gloucester, VA.
Jun 17-19: Meeting of the Anglican Joint Synods and Polish National Catholic Church Dialogue, Lancaster, NY. Jul 15-19: Synod of the Diocese of the Eastern United States, Diocesan Standing Committee meeting, Saint Alban’s Cathedral, Oviedo, FL. Mar 26-28: Anglican Joint Synods (G-4) Clergy Retreat, Monastery of the Holy Spirit, Conyers, GA.
Apr 13: Special Meeting of the Board of Trustees of St. Andrew’s Theological College and Seminary, Charlotte, NC. Jul 6: Presenting for ordination, Kevin Fife to the Sacred Order of Deacons, St. Matthew’s Church, Weaverville, NC. Jul 15-19: DEUS Synod, St. Alban’s Cathedral, Oviedo, FL. Jun 21-22: Visitation to Christ Anglican Church, Houston, TX (Church of Nigeria parish). Jul 16-20: Attending DEUS Synod, St. Alban’s Cathedral, Oviedo, FL. Mar 26-28: Lenten Clergy Retreat for the Anglican Joint Synods, Monastery of Our Lady of the Holy Spirit, Conyers, GA.
Apr 24-27: Convocation for Restoration and Renewal of the Undivided Church, sponsored by the Polish National Catholic Church and the Union of Scranton, Saint Stanislaus Cathedral, Scranton, PA.
May 4-5: Episcopal Visitation and Confirmations, Saint Philip’s Church, Blacksburg, VA.
May 21: Meeting of the Federation of Anglican Churches in the Americas (FACA), Saint Barnabas Church, Dunwoody, GA.
Jun 9-14: Counsellor and Instructor, Anglican Legacy Camp, Westfield, Surry County, NC. Jun 23: 40th Anniversary Celebration of Saint Barnabas Church, Dunwoody, GA.
Jul 6: Ordination of Kevin Fife to the Sacred Order of Deacons, Saint Matthew’s Church, Weaverville, NC. Jul 15-19: Synod of the Diocese of the Eastern United States, Diocesan Board of Examining Chaplains meeting, Diocesan Standing Committee meeting, Saint Alban’s Cathedral, Oviedo, FL. Apr 9: Southeast Florida Traditional Anglican Clericus, Delray Beach, FL. May 14: Southeast Florida Traditional Anglican Clericus, Delray Beach, FL. Jun 11: Southeast Florida Traditional Anglican Clericus, Delray Beach, FL. Jul 9: Southeast Florida Traditional Anglican Clericus Delray Beach, FL.